This award was given on September the 28th last in Budapest by the IELA – International E-Learning Association, based in New York and including members from all continents and from all sectors (industry, businesses, governments, universities). IELA’s objective is to promote knowledge and e-learning practice in classrooms, universities and in workplaces. The “University for Refugees” is the first online portal across the world – designed by the International Telematic University UNINETTUNO - that is, by now, available in English, French, Italian and Arabic, aimed at integrating immigrants, refugees and asylum seekers by granting them access to education and the recognition of their professional skills. The “University for Refugees” is based on the idea that only knowledge can represent an actual instrument for peace, capable of promoting good immigration, dialogue and the peaceful coexistence of peoples and international cooperation. 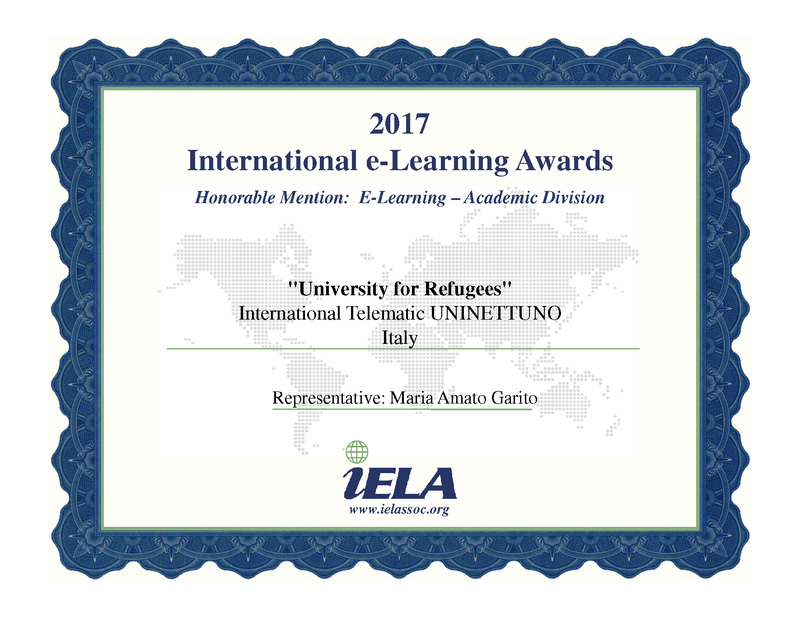 Thanks to the “University for Refugees”, refugees and immigrants enrolled in the academic programs of the International Telematic University UNINETTUNO can attend the lectures of teachers coming from their own Countries (i.e. Syria, Egypt etc.). Actually, UNINETTUNO decided not to simply rely on a translation of the contents produced by Italian teachers; on the contrary, it involved the best lecturers coming from several universities across the world allowing them to realized lectures in their own language. Today, some of these lecturers – because of the situations of crisis suffered by their Countries of origin – cannot deliver their courses any longer. Their lectures included in UNINETTUNO’s programs thus acquire a great symbolic value and keep alive the experience of an academic class that would have been otherwise lost.